The Light Blue Darwin One by MT (Darwin)…what actually is it? A fat tyred, expedition tourer that is ready to take on as many miles as you care to throw at it. I don’t regard myself as a tourer, or much of a bikepacker, I’m far too old and set in my ways for that. I will however, happily spend long hours in the saddle both on and off road so I decided to review it as such. Is it a bike I’d like to spend all day riding? If not, is it something I could have fun on? 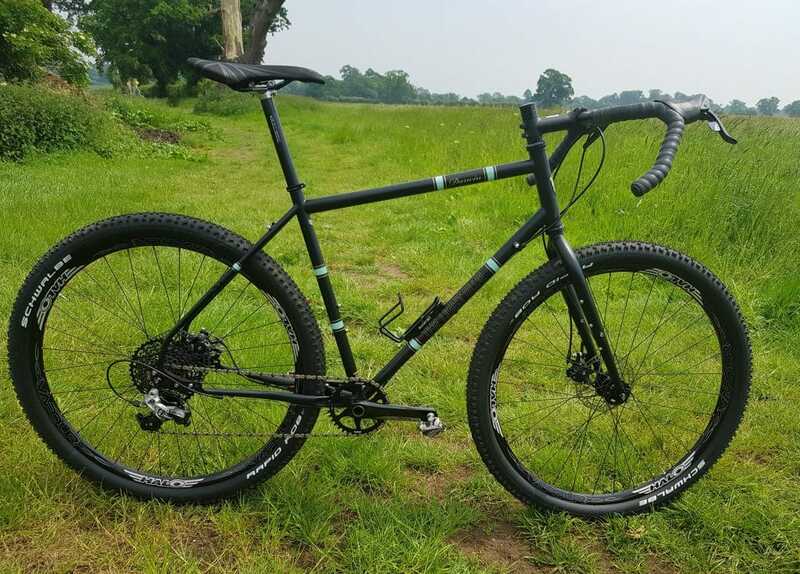 Fat tyres, drop bars… Does the ‘MT’ in its name stand for Monster Truck? At the heart of the Light Blue Darwin One By MT is a custom Reynolds 725 cromoly frame. The top tube is oval/oval and the down tube is bi oval for extra stiffness in the Bottom Bracket area. The top tube is quite narrow and as a result I found it difficult to keep the top tube bag from shifting about when loaded. It also tended to dig in when carrying the bike or shouldering it over gates. This is definitely where flatter, wider, aluminium or carbon tubes have an advantage. The head tube is very long, and puts the rider in quite an upright position. The frame meanwhile, has all the mounts for bottles, racks and mudguards that you could ever want. A word about the frame based bottle cages. Our bike came fitted with the innovative Cage Mover . 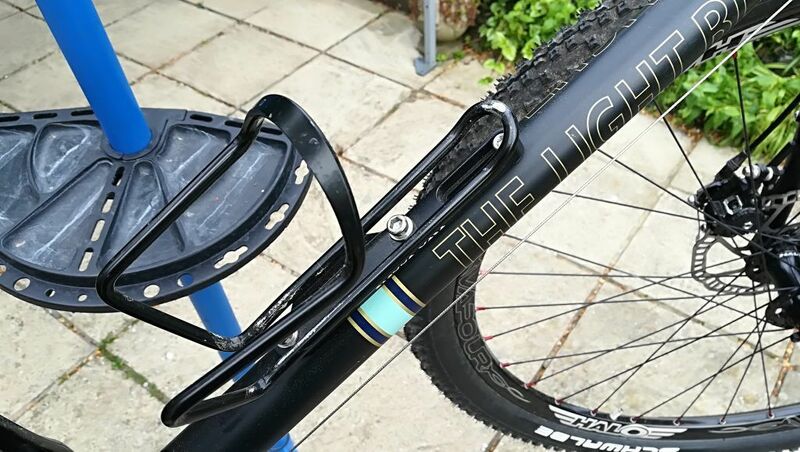 The cage mover gives you up to 30mm adjustment for the bottle cage. If your bags are in the way, your frame is small and you need some more room, or you want the bottle cage in just the right place, this little gizmo might save the day. There are mounts for three bottles on the main triangle. 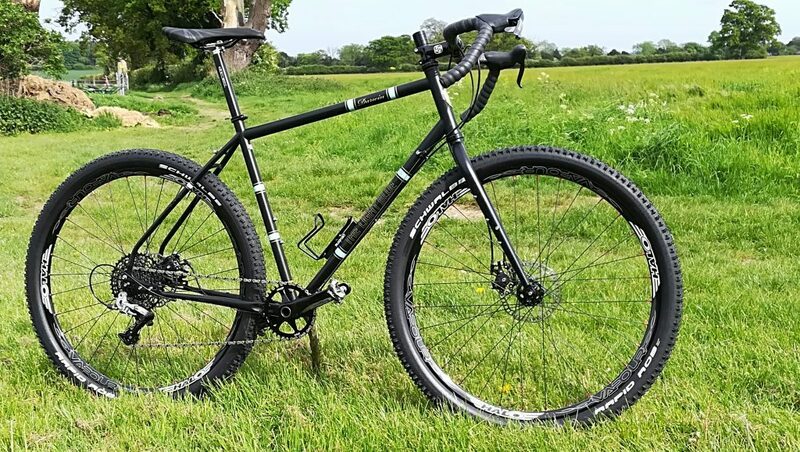 Meanwhile, the Cro-Mo Darwin MT fork gives you extra options for even more bottles or luggage (via a Lug Kage), as well as having clearance for 29×2.25 tyres. 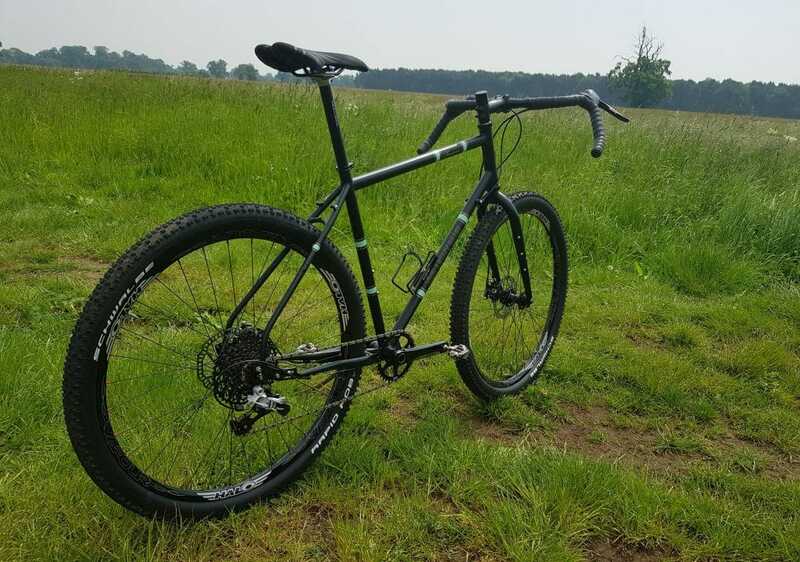 The Lug Kage is Passport’s lightweight variation on a front fork carrier. Good for 3kg each, these allow you to carry even more gear. Best mounted in pairs, at £19.99 each, these seem particularly good value. Out back are some rather inelegant, but functional, custom, drop outs (the ADS-3). Bristling with bolts and peppered with slots, they aren’t going to win any fashion shows. You can’t escape the fact that they add a chunk of weight to the back of the bike too. So what are they all about? 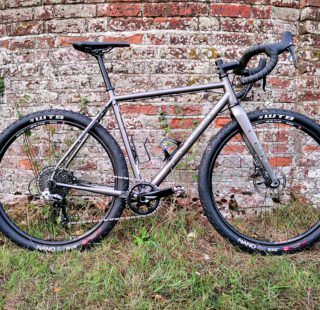 If you buy a Darwin, you can opt for a traditional rear mech and cassette option, a Rohloff setup and even a belt drive. Incidentally, to run belt drives, frames have to pass a stiffness test. The Darwin frame has been tested and has passed. No wallowing bottom brackets here then! Frame and fork are disc only. The bike was supplied with Avid BB7s. Not my favourite but there is nothing to stop you retro fitting hydraulic brakes if you want. Notwithstanding this, for the first time ever, I was using cable operated disc brakes that actually work! Cables are run externally along the underside of the downtube as a nod to easy maintenance on the trail. 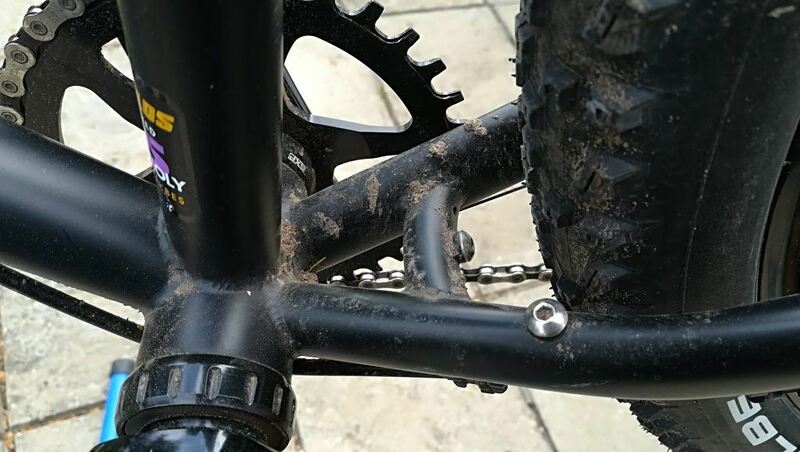 The ability to take chunky 29er rubber means this really is an all conditions, multi terrain bike. It should open up all sorts of previously inaccessible trails for the ambitious bikepacker. 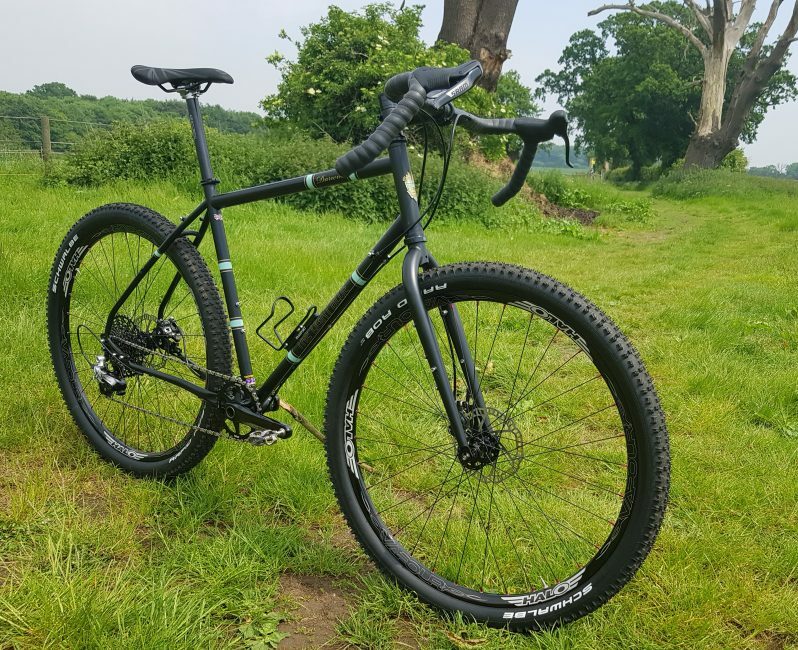 There is more than enough room between the tyres and the frame to let you ride through the worst of trails and conditions without clogging up. Plenty of room in the bottom bracket area. The Darwin came in a flat black paint, with “Light Blue” detailing. I usually dislike black paint on a bike. Generally it gets grubby very quickly. The matte finish on the Darwin though, looks as though it will keep looking good for some time. Loads of room up front too. 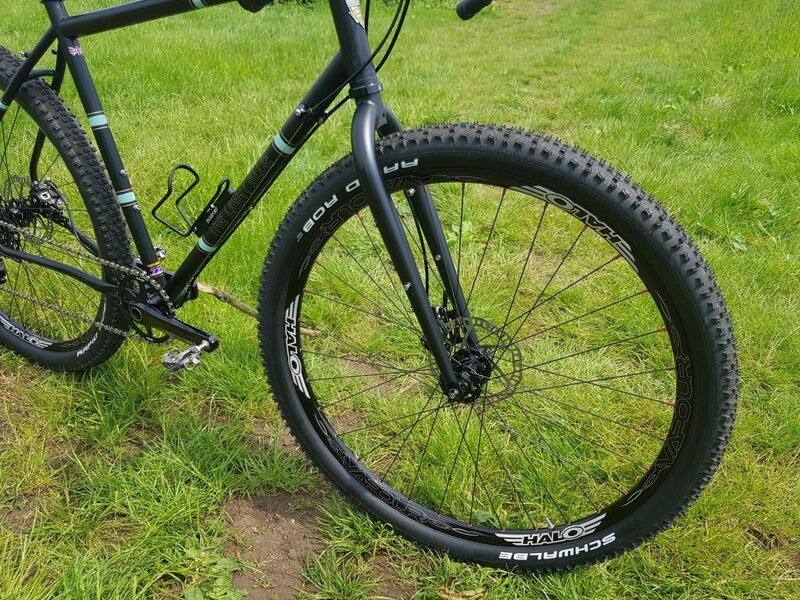 Our bike was supplied with the excellent, tubeless ready, Vapour wheelset from Halo Wheels. 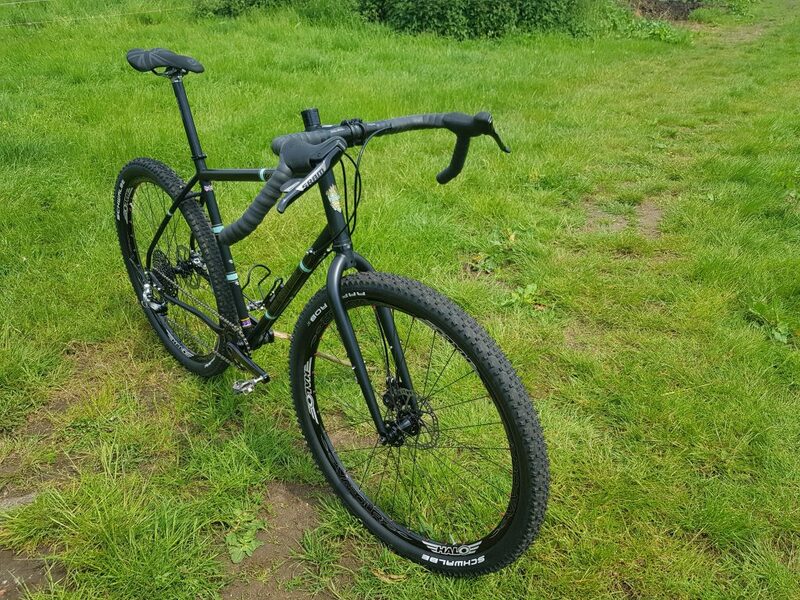 The Vapour is described as being ideal for XC riding, off road adventures and trail riding. Built with a 21mm internal width rim they are ideal for a slightly narrower tyre. Halo Vapour wheels stand out as a fantastic wheelset. You’ll have no need to upgrade from these. As well as a lightweight and robust rim, the wheels use the new and improved 120 point pickup MT Supadrive and MT Front hubs, with sealed bearings and wide spaced flanges for increased stiffness and durability. I like these wheels, I like them a lot. If a wheel has any flex or weakness, I can usually find it – mainly because I am a bit of an animal on a bike. Needless to say, I found nothing to complain about, and I love the Supadrive. 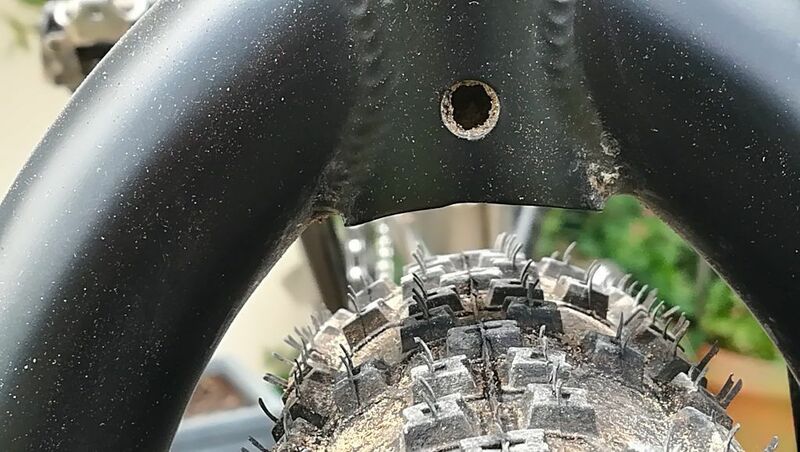 The supplied tyres were heavy, wire bead Schwalbe Rapid Robs which deadened the ride. The Halo branded skewers need a 5mm allen key to tighten up. I used to have these on my XC racer because they were so light. It was strange to see them on a tourer. 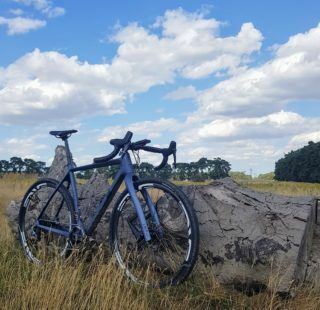 Light Blue Darwin One By MT – Halo Vapour wheelset is a fantastic addition. 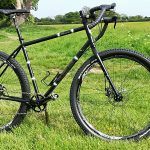 I spoke to Distributors ISON regarding 650b and Road Plus on the Darwin. 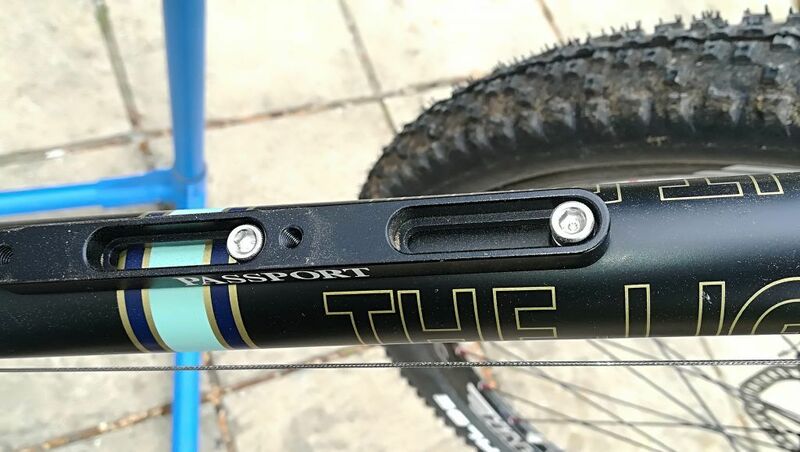 Light Blue did not design for 650b however, keep an eye on bottom bracket height and tyre clearance and you should be OK if you want to experiment. The team at The Light Blue explained that they have a dynamic approach to gearing (on the Darwin) at the moment. 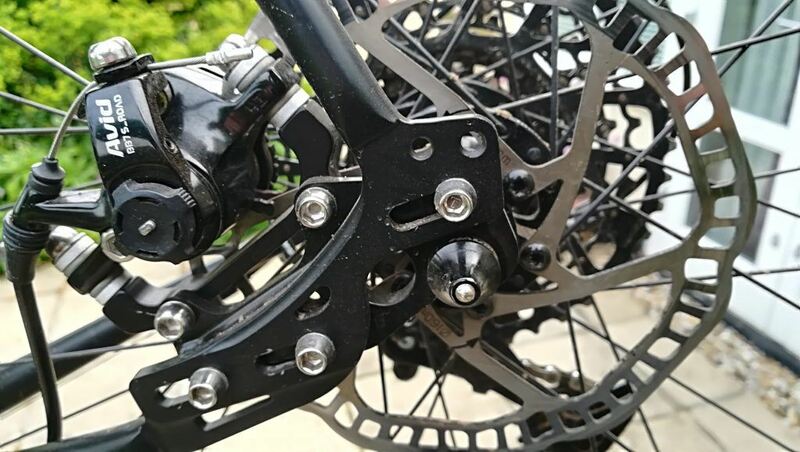 This iteration came with a 1×11 SRAM Rival setup. A 36 tooth chainring up front, is married to an 10-42 cassette, giving a wide range of gearing options for the long distance rider. 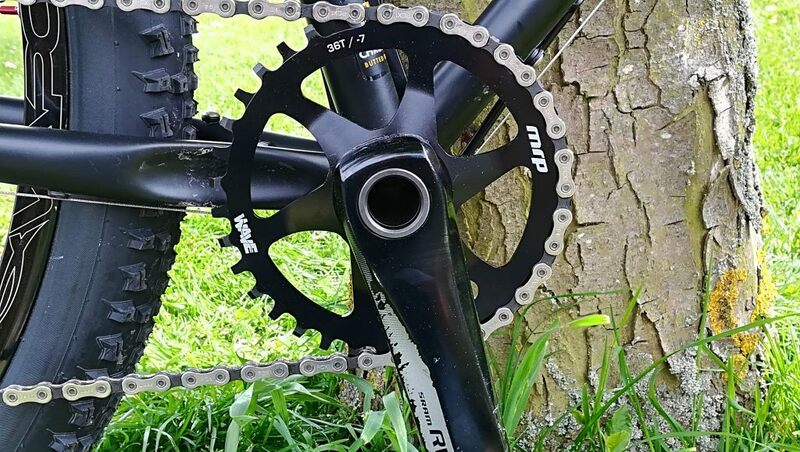 The chainring is a 36 tooth MRP Wave Ring. Wave technology is a developmental advance over the ‘narrow/wide’ chainring that allows you to run 1xn without a chain device. I had planned to precis the technology and the benefits however, ISON have done a pretty good job here. I have only ridden the bike in dry and dusty conditions but I did my best to dislodge the chain by riding the lumpiest trails I could find. Whatever I threw at the bike, the chain never missed a beat. I was seriously impressed. I decided to put the bike through its paces over B roads, potholed back roads, fire roads, hard pack and singletrack. Generally, it was well mannered. Once up to speed, I could cruise along at 18s or 19s. It isn’t the quickest to get up to pace but once there, it was happy to carry me along. Climbing though…that was a different matter. The Darwin responds best if you spin away using the most comfortable gear you can. Do this, and you will make it to the top, just don’t expect to show Chris Froome a clean pair of heels! Likewise, putting the hammer down on the flat is not particularly rewarding. Let the Darwin build up to cruising speed gradually. Once there, it is as happy as Larry. Easy singletrack (no rock gardens or anything like that) is a hoot. The 2.25 tyres gave me all the grip I wanted and as long as I didn’t get over enthusiastic, the steering made navigation easy. On short and sharp climbs, you could rely on momentum to carry you up and over. Longer hauls were predictably a bit of a slog. I had to swap the super short stem for a 110mm. The ‘Large’ frame is really a little small for me hence the need to extend the reach. Interestingly, I expected the longer stem to slow the steering down, but I was so wrong. It remained lively and positive throughout. Curiously, the front end remained light too and popping the front wheel over logs was surprisingly easy. 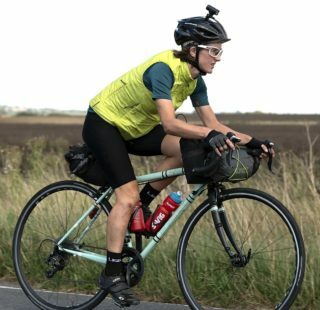 The Darwin is not a lightweight sports tourer and it never will be. If you want something reliable that you can travel the world with, then it could become your best friend, no matter what the surface. 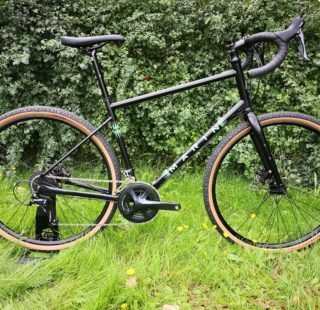 If you aspire to put the likes of Josh Ibbet under pressure in the Transcontinental though, this isn’t the bike for you. It is worth noting that this bike only goes up to ‘Large’. At a shade under 6foot 4ins, even with a 110mm stem, it felt a bit too short. If you are tall, I’d recommend you try before you buy. How does the Darwin stack up to my test criteria? Could I ride it all day? With a few minor adjustments, yes. Is it a bike you can have fun on? Probably. I know I had a real blast on it once or twice.